Kitchen Design. The same functional design principles that govern your indoor kitchen apply outdoors. Task areas must be defined for food preparation, cooking, serving, seating and clean up. You will need lighting at task areas and for general illumination. Weather. 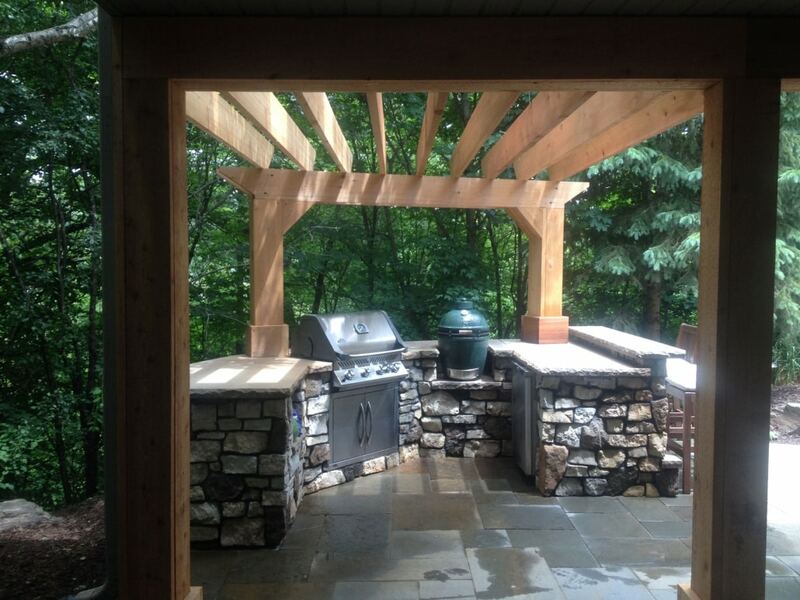 Ideally, we’ll want to locate your outdoor kitchen in a spot that gets some natural shade. Or, build a pergola for canopy. A fully roofed structure such as a pavilion or pool house will shelter your kitchen from rain as well as sun. If you’d prefer to keep it simple, stylish umbrellas can do the trick. Utilities. Gas and electric lines will be needed. The distances those lines have to travel to reach your outdoor kitchen will affect cost. Location. Convenience is the first consideration. You will need to bring supplies to the kitchen and remove waste. If the kitchen is too far from the house, you won’t love running back and forth to get the seasonings or stack of plates you left on the counter indoors. Wind. We position the grill station so that prevailing winds blow smoke away from seating and dining areas. Materials. Durability is the word. 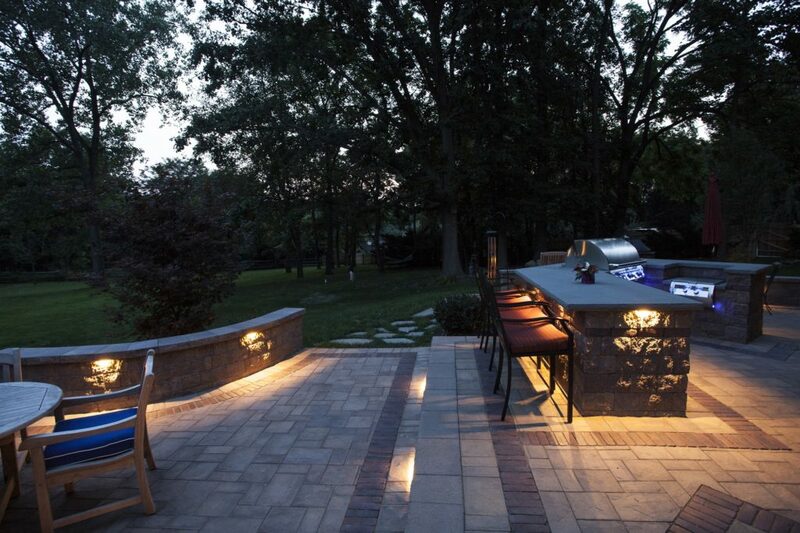 Your outdoor kitchen needs to stand tough through the hot, the cold and the wet of life outdoors. Countertops are stone—oftentimes the same stone we use for paving. We apply thermal conditioning and sealants to prevent stains. 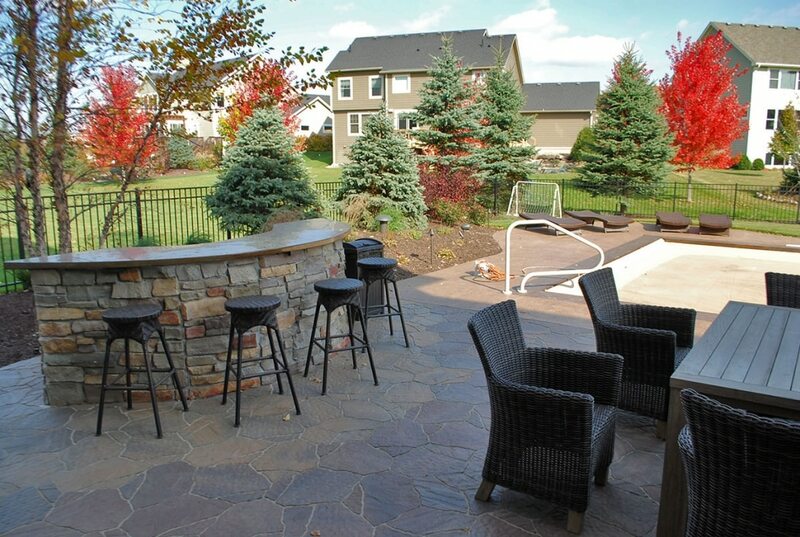 The style of outdoor bars and kitchen and dining area that works best is simply the one that works best for you. Here are a few outdoor cooking/dining installation types that have worked perfectly for the size of the yard and the needs of the client. A simple built-in grill station is located just steps away from the covered patio dining area. It’s nearness to the house makes for easy access to food and supplies. When appropriate, we position the built-in grill or kitchen structure to hide air conditioning units or other utilities from view. This large grill station is neatly built into a retaining wall. There is generous counter space on either side of the grill and a refreshing view of the landscaped hillside just beyond the stone capped backsplash. This full feature kitchen with split-level bar is smartly located between the garden entrance and patio doors of the main house. It efficiently includes café seating, food prep area, large under mount sink/dishwasher, and an under counter refrigerator. All stone construction and stainless steel appliances. This luxury stone and steel kitchen are inside a pool house with dining area and stone fireplace. Note the large range hood over the grill. This L-shaped kitchen/dining patio is shaded simply by umbrellas. And, it’s conveniently located a few steps from an air-conditioned pool house (just in case). OUTDOOR KITCHEN AND DINING areas share the stage with other entertainment and play areas. There may be a pool, spa or outdoor fireplace in the mix–and there needs to be a logical connection between activity areas. It’s up to your landscape architect to balance those relationships and integrate them into the overall landscape design. 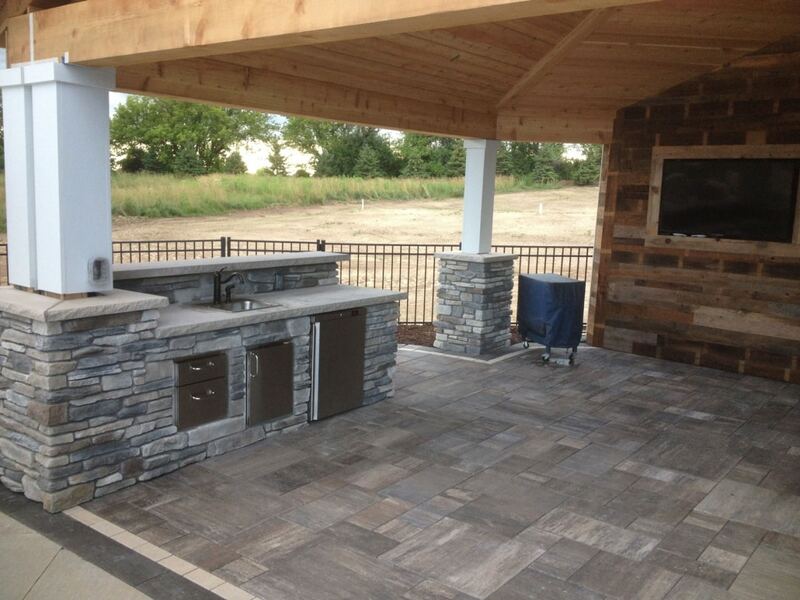 Are you ready to start designing your outdoor kitchen or built-in grill station?